As any voracious reader knows, there are so many books out there, it can be hard to choose just what to read next. So what could be better than a hand-picked recommendation from someone in the know? Every Wednesday the XOXOAD team likes to find out what some of its favorite authors are reading; today we’ve asked Kim Wright, author of THE UNEXPECTED WALTZ to tell us! I’m obsessed with this book, which takes place on a single day in 1632 in the city of Amsterdam. The plot swirls around one of Rembrandt’s earliest and most famous paintings, a work called The Anatomy Lesson, which shows a doctor cutting into a cadaver while his students lean forward with avid, or maybe even borderline creepy, excitement. In her novel, Nina Siegel has created a backstory to go with the painting, giving a voice to the doctor, the artist, the students, and the corpse. Ok, admittedly that sounds like a subject that could either be dull or gruesome or both. But Siegel is such a master at handling multiple points of view that she smoothly interweaves the stories. The book is cast as a bit of a mystery, since a present day art historian is studying the painting in an effort to learn more about Rembrandt’s techniques and along the way she learns that Rembrandt altered the painting. Uncovering what Rembrandt changed—and why—drives the plot, but the real genius of the book is that it completely transports you back to 1632 Amsterdam, a time when a sleepy city is waking up and, thanks to the tulip craze, becoming a bit of boom town. A time when money is pouring in and science—especially medicine— is gaining prominence. A time when the greedy and ambitious thrive and the poor and luckless end up on a mortuary slab. I was first drawn to the book by a bad review on Amazon. The reader announced that the story “wasn’t her cup of tea,” and for some reason any time someone declares that something isn’t their cup of tea I’m pretty sure it will be mine. I think the reader may have been objecting to the gritty realism and grisly subject matter…or maybe this person didn’t like the multiple points of view, which does force the reader to pay close attention. This isn’t a book to skim and although I plan to take it with me next weekend on vacation, it’s not exactly your classic beach book. But what I’m loving about it is that each time I pick it up I’m transported to a different time and place and that’s what I think reading is all about. 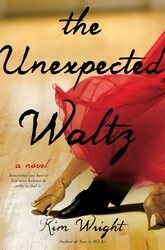 I enjoy diving into a strange subculture— which may explain why “Toddlers and Tiaras” is one of my guilty pleasures and why I’ve tried to do something similar with my own book, The Unexpected Waltz, which takes place in the downright wacky world of ballroom dance. It’s fun as a writer to pull back the curtain and show the reader a fresh little piece of the world and just as fun to be the reader who discovers, page by page, a side of life he’s never experienced. Predicting what’s going to happen in the world of publishing is always risky, but here’s my guess. I think we’re going to see more books which use tidbits of history as a jumping off point for an imagined story. The writer will create an entire world around these slivers of facts, populating his book with a cast which is partly fictional and partly fictionalizations of real people. Call it a new breed of historical fiction, call it faction, call it whatever you wish. But if it gives us more books like The Anatomy Lesson, I can’t wait. Set in one day in 1632, The Anatomy Lesson is a portrayal of Golden Age Amsterdam as it tells the back-story to Rembrandt's first great work of art.